Another one for autumn. Entitled 'So long, ducky', I bought another bunch of Copic markers to complete this picture! The design came out slightly different from intended, perhaps my choice of colours makes the leaves appear like fallen petals instead. Also the white dotted ripples was done when I was almost dozing so the angles are a little off. Did you notice the gold dots on the top? It doesn't appear too well in the scan. Enjoy anyway! I think I shall continue with drawing some ACEOs next. And they crumble in your hand"
It's beautiful. I like reflections in the background and the colors too! This is so pretty. I love the colors. This one is phenomenal! 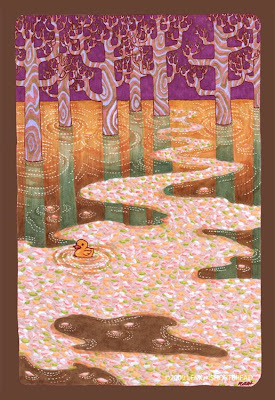 I love the idea of a little ducky wandering through a winding forest creek. The trees look beautiful, and the ripples in the water are very realistic. I would give anything to be able to draw as well as you do! I LOVE this! The purple is a perfect colour! and I love all the little details. SO cute! Just lovely, you can really feel the floating motion! I love it. The duck, also the water is gorgeous but the trees and the their green in the water is my favorite. I hope the duck will be okay!